How Does an Adjustable-Rate Mortgage Work? How Does an Adjustable-Rate Mortgage (ARM) Work? How does an adjustable-rate mortgage work? Here's the short version: These loans have a variable (or changing) interest rate that adjusts on a regular basis, typically every year. They usually have some form of "cap" that limits how much the rate can rise during each adjustment. This makes them unique from fixed-rate home loans, which never change. The adjustable-rate mortgage (ARM) loan seems to be making a comeback lately. ARMs fell to around 3% of total application volume after the housing crisis, as a result of being labeled a "high-risk" mortgage product. But they are now rising in popularity. ARM loan application volume rose to 7% the week this article was published (late 2013), according to the Mortgage Bankers Association (MBA). As you read through this tutorial, you'll soon realize they are only "risky" when used over the long term. As a short-term financing tool, they offer some compelling advantages. When it comes to ARM loans, education is critical. These loans are more complicated than their fixed-rate counterparts. As a result, borrowers have a steeper learning curve. Here's what you need to know about them, as a borrower. Definition: Also referred to as an ARM loan, the adjustable-rate mortgage is a home loan with an interest rate that changes periodically. This is vastly different from a fixed-rate product, which carries the same interest rate for the entire life or term of the loan. With an ARM, the interest rate changes in correlation to an index (such as the Cost of Funds Index, or the 1-year Treasury rate). The monthly payment may increase or decrease along with these rate changes. How does an adjustable-rate mortgage work? This depends on the type of ARM loan you use. You have several different options to choose from, and they behave in slightly different ways. But they all share one thing in common: The interest rate on the loan will change with some kind of predetermined frequency. This is the most important thing to understand about an ARM. It is their defining feature. These days, most adjustable mortgages are considered "hybrid" loans. As you know, a hybrid combines two or more qualities in a single item (like a hybrid car that has both an electric and a gas-powered engine). A hybrid ARM loan starts off with a fixed rate for a certain period of time, such as three or five years. After that initial phase expires, the rate will start to adjust at a predetermined interval. They typically adjust once per year, after the initial phase. The initial interest rate might remain fixed anywhere from one month to five years, and sometimes even longer. During this period, your monthly payments will stay the same as well. So the adjustable mortgage basically works like a fixed-rate loan during this initial stage. Consider the 5/1 ARM loan. This is one of the most popular adjustable-rate mortgage products. Here's how it works. This loan starts off with a fixed rate for the first five years of the term. That's what the "5" indicates in the label. After this initial period, the rate will start to change every year. The "1" after the slash tells you it will change every one year after the five-year fixed period. A 7/1 ARM behaves exactly the same as the product described above, but with one key difference. Can you guess what it is? With this product, the initial fixed-interest period lasts for seven years. You get the idea. Here's the most important thing to understand about how the adjustable-rate mortgage works. The initial interest rate and monthly payment might be much lower than what you encounter later in the term. By their nature, these loans are unpredictable. That's their biggest downside. You never know exactly how much your rate will rise over time. You might know what the first adjustment will be, but the years following that are something of a mystery. Thankfully, there are caps to limit how much they can increase (see the next section). Consider: If your ARM loan stretches your budget to the limit during the initial phase, it could become completely unaffordable down the road. This is known as "payment shock." To understand how an adjustable-rate mortgage works, you must also understand the concept of caps. Most ARM loans in use today have limits or "caps" on the amount the rate can change. There are also caps that limit how much the monthly payments can rise. Periodic adjustment caps limit how much the interest rate can rise from one adjustment to the next (after the first adjustment). Lifetime caps limit the rate increase over the entire term or life of the loan. Lifetime caps are required by law, so you'll find them on nearly all adjustable-rate mortgage products in use today. Here's an example of interest rate caps in action. Let's assume you have an ARM loan with a periodic adjustment cap of 2%. This means the interest rate can rise by no more than 2% during any one adjustment. Let's further assume the index (which influences the rate on your particular mortgage loan) rises by 3%. The image below shows what would happen with and without the all-important cap. 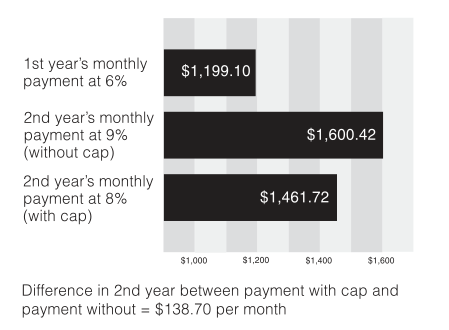 In this example, the monthly payment with the rate cap is $138.70 lower than it would have been without any sort of limit in place. This would save you about $1,664 over the course of a year. This is how adjustable-rate mortgages work when there is a cap in place. If you decide to use one of these products, make sure you ask about (and fully understand) the limits that are applied to the loan. ARMs can also have payment caps. As you might have guessed, this limits the amount your monthly payment can go up during each adjustment. So clearly, this is an important concept for borrowers to understand. For instance, if you have an adjustable-rate mortgage with a 6% payment cap, your monthly payment cannot increase by more than 6% over the previous amount, even if interest rates in the broader economy rise by more than that. "Any interest you don't pay because of the payment cap will be added to the balance of your loan. A payment cap can limit the increase to your monthly payments but also can add to the amount you owe on the loan." As you can see, ARM loans are much more complicated than their fixed-rate counterparts. So you really have to understand how the adjustable-rate mortgage works, before using one. This guide offers a good overview of the subject. But it's not exhaustive. We encourage you to continue your research beyond this website before pursuing this type of product, or any other type of financing for that matter.